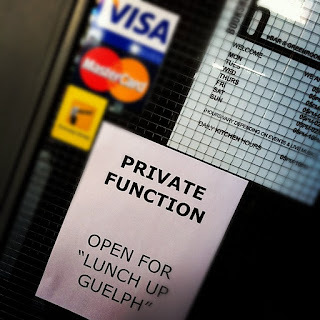 100% Candice: What is LunchUp Guelph? I've spent this month trying to define Lunch Up Guelph to build our website. It hasn't gone well. How do you define something that created itself? How do you define something you never planned? It's really difficult to take this step of legitimizing what's been created here when I really feel like I had nothing to do with it. At it's most basic #LunchUpGuelph is simply an empty canvas that the people who attend fill with their creativity. I, and my very helpful co something or others Rob Campbell and Sean Yo, spend some time each month choosing a venue, a menu, and doing some admin like keeping a list and printing name tags. We open the doors and the minds and let you have the conversation. However, when I look at Lunch Up Guelph more closely I see real magic. While helping therobcampbell out with the drive to Bring Q to Guelph I realized that the group of people we have brought together through Lunch Up is a truly powerful group of people. We have artists, scientists, and doctors. We have IT specialists, web developers, programmers and coders. We have students, we have teachers. We have business owners, professionals, holders of public office. Mortgage agents, realtors, financial advisers. I dare you to name a profession, hobby or expertise that we don't have covered. If you want to gauge the pulse of the economic reality of Guelph, the artistic community of Guelph, the political values of Guelph, the wellness of our city, our home, these are the people to ask. And if you want to make a change in our city, these are the people to ask for help. A community is as strong as it's members and ours is full of superheroes!